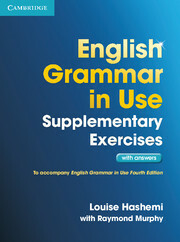 This new edition is thoroughly updated and revised to acompany the fourth edition of English Grammar in Use. The book contains 200 varied exercises to provide students with extra practice of the grammar they have studied. Get an eSample of English Grammar in Use Supplementary Exercises that will allow you to view a product preview on your desktop.